BUILDING 1 continues to progress with the completion of the roof, electrical service rough-ins and sprinkler installations. Exterior paint base coat is installed on 3 sides of the building, overhead doors are now installed and field dimensions are on going for canopies, storefront and metal panels. BUILDING 2 slab is now complete and 60% of the concrete panels were erected by month’s end. Steel framing is in progress with decking following close behind. 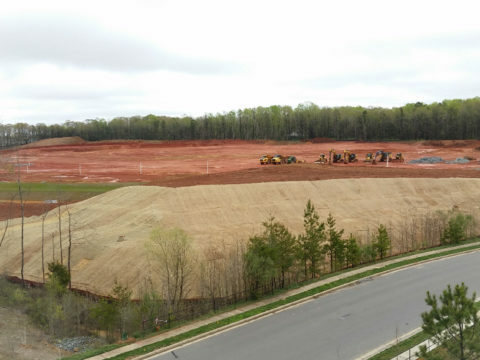 Site work continues at lots 3-6 and final grading for the public road is in progress.